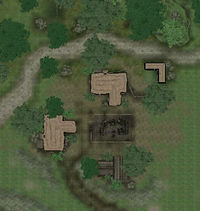 Aleswell is a village with an inn north of the Imperial City (quest-related). 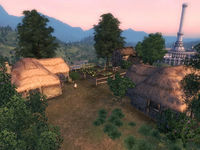 NPCs who talk about Aleswell refer to it as a "town" or "village", although it consists of only two huts, the Aleswell Inn, and a vegetable garden. The garden is a fairly significant feature in the settlement, as 8 lettuce plants, 3 watermelon vines, 15 corn stalks, 5 potato plants, 2 pumpkin vines, and 6 radish plants grow inside of it, along with 4 sheep in the corral. There are rumors that Aleswell's citizens vanished without a trace, and that it is now inhabited by ghosts. Zero Visibility: Help the citizens of Aleswell become visible again. This page was last modified on 26 February 2019, at 07:52.